The construction of a “state-of-the-art” dam is underway near Kurdistan Region’s capital city of Erbil, due to be completed late 2019, utilizing techniques that cut down on costs and construction time. 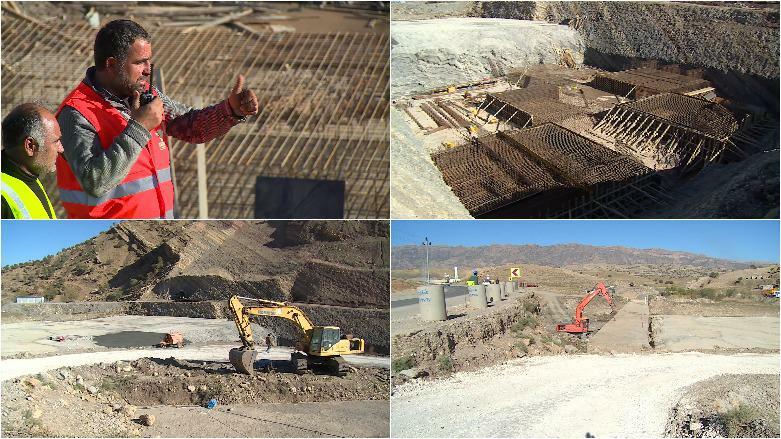 The Kurdistan Regional Government (KRG), in partnership with a local construction company, is working on the Goma-Span dam – nearly 35 kilometers east of Erbil – which is under construction on Bastura Chai – a tributary of the Great Zab River. Speaking with Kurdistan 24, Akram Ahmed, Head of General Directorate of Dams and Water Resources, condensed the significance of the project in two points: using a new construction method, and creating a reservoir of water near Erbil to put to use. “The type of dam will be unique among all others in Iraq,” as the technique the directorate had agreed to utilize is roller-compacted concrete – a special method used to expedite construction and lower costs when compared to conventional ways used to build other types of dams. Goma-Span is estimated to able to hold a reservoir of 81,000,000 cubic meters of water. The dam’s length will be 375 meters, with a base width of 70.5 meters and a height of 70 meters. The project’s budget is approximately USD 82,000,000, according to the contract signed with the construction company. However, with some adjustments to the details of the plan, an additional USD 3,500,000 was added to the costs. The project’s deadline is on Nov. 16, 2019. “Right now, we are using our own funds for the project.” Although “the government [Erbil] has supported us, they cannot continue as the region is going through an economic crisis,” said Abdulla Gardi, owner of the construction company. “I hope other companies continue their works as we pass this financial crisis, which is near its end,” Gardi added. In mid-2018, the KRG started to allocate new budgets and resume projects which had been stalled or halted over the past few years.